Cape Canaveral Air Force Station, Florida. October 1, 2014 – Last night, United Launch Alliance (ULA) rolled the Delta IV Heavy rocket from its processing facility to Space Launch Complex 37 in advance of the December 4 Exploration Flight Test (EFT-1) for NASA’s Orion spacecraft. Today, the rocket was raised from a horizontal position and placed on the launch pad for final processing, testing and checkout. In addition, the team will conduct a high fidelity rehearsal to include fully powering up the booster and loading the tanks with fuel and oxidizer. In November the Orion spacecraft, built by prime contractor Lockheed Martin, will be moved to the pad and placed on top of the Delta IV rocket. Orion, built by Lockheed Martin, will be launched aboard a Delta IV Heavy launch vehicle which features a center common booster core along with two strap-on common booster cores. Each common booster core is powered by an RS-68A liquid hydrogen/liquid oxygen engine producing more than 700,000 pounds of thrust. A single RL10 liquid hydrogen/liquid oxygen engine powers the second stage. ULA constructed the Delta IV Heavy launch vehicle in Decatur, Alabama. “The Delta IV Heavy is the world’s most powerful launch vehicle flying today, and we are excited to be supporting our customer for this critical flight test to collect data and reduce overall mission risks and costs for the program,” said Taliancich. The uncrewed EFT-1 flight will take Orion to an altitude of approximately 3,600 miles above the Earth’s surface, more than 15 times farther than the International Space Station’s orbital position. By flying Orion out to those distances, NASA will be able to see how Orion performs in and returns from deep space journeys. 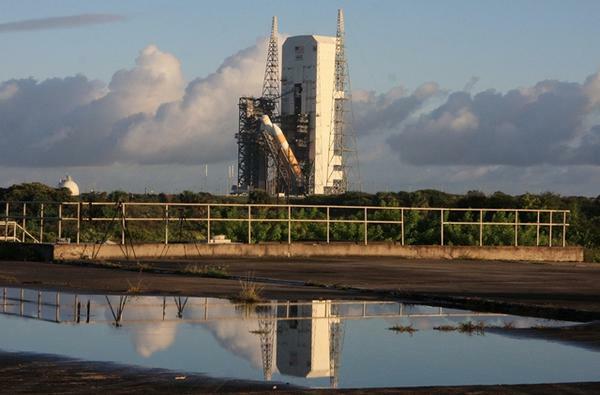 Orion will return to Earth at a speed of approximately 20,000 mph before splashing down in the Pacific Ocean. EFT-1 will provide engineers with critical data about heat shield performance, separation events, avionics and software performance, attitude control and guidance, parachute deployment, and recovery operations to validate designs of the spacecraft before it begins carrying humans to new destinations in deep space.